A merry group of 7 (Shirley, Fiona, John W, Chris H, Paul F, Anthony and myself) met for this unseasonably warm bike ride from Horton. Our route took us on The Pennine Way out to Birkwith Moor through Cam Woodlands and a lovely descent to Beckermonds. Alas what goes down eventually goes up and so it did after Oughtershaw with the ascent of Fleet Moss, Just prior to us beginning the ascent Chris H and his E bike were seen (for the last time by us as he continued on) making light work of the ascent. The rest of us Just got on with the job in hand of the ascent and eventually made it to the top with a bit left in the tank and with me realizing I either needed a) a new saddle or b) better padding in derriere region which at the time felt like 2 raw steaks, a comparison I suggest you don’t dwell on. A slight descent towards Hawes and we turned off onto the Pennine Bridleway and found some shelter from the wind for lunch. 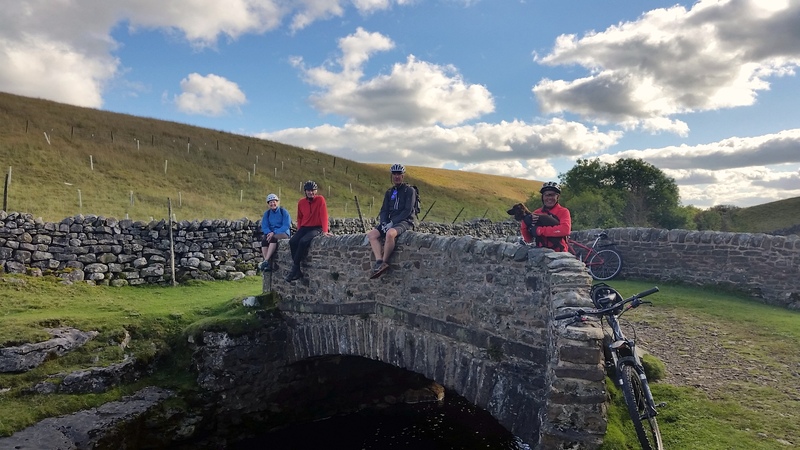 Once refuelled we continued along the Pennine Bridleway and a delightful descent took us to Ling Gill and onto High Birkwith before the last roller coaster minor road back to Horton. Thanks to Shirley and John for organising this meet. Eight of us plus pickle enjoyed an evenings bike ride ride from Skirethorns near Grassington. Our route to us uphill onto Malham Moor and round to Bordley before heading back over Boss Moor as the sun was setting. Thank you John for organising this.